By CARETAKER46, February 22 in ! !..DIY Installers..!! got it going , the problem was needed to add the password and now it working. It had the ssid , I thought already had the password typed in, but when I typed the password it worked.But like you said as it is WiFi so this may be doing this now again, sounds like my Wife lol. I bought it from Ebay. I asked the guy who I bought it off and he said he had no issues and it was working fine and the Hikvision said it is common problem and told me to update the firmware or send it back, but I bought it from ebay, so I have to keep it now and get it working. My firmware is V1.4.62build 180515..
DSP version V1.0, build 180115. Hikvison sent Doorbell firmware for KB6003 V2.1.0_181224 , which I don’t know how to upgrade onto the SADP . Is the cat5e Cable ok for the job I need to for my cctv project. I have purchased this cable SFX CAT5e UTP Cctv External PE Outdoor Black cable Solid copper. another issue I have since the new transformer been changed from 8V 1Amp to 24v transformer from Screwfix and it worked really well from Sunday to Wednesday night and then it just gone offline and I have got WiFi booster near the video door bell and still showing offline. i reset the device , by pressing the reset button for 15 seconds and i had no luck, just don’t seem to able to connect to WiFi, I don’t know if it the virgin Media Hub 3.0. May be some restrictions. I even disconnected Ding Dong Chime wiring and still the same can not connect to WiFi on the door bell. Do do you have any ideas what could it be. I purchase the Nvr and the camera from ebay, so I was just checking it out and updating the firmware. i also tested out by connecting the video door bell and it works , but I think it will only record , if there is motion detection, not continuous recording. i will be fitting the camera , but I will need to buy the junction box to fit the spare cable inside the junction box. I also need to buy the Rj45 connector and the crimp tool . update on the video door bell , what you guys said it is not the same as the where they show on advert, but you need a good WiFi and sometimes it can take time to connect . Recently I have been having problem the video door bell keeps going offline now again and when it goes offline, you still get motion detection, but it does not catch all motion detection when it offline. I then have to reboot to factory setting to catch the WiFi and see the live viewing. Camera still have the cling sticker , as I did not take these off, as I was testing it to make sure everything is working and the video door bell night vision is not that good and it can vary, as sometimes depending on the light from the street and cars passing by reflection light. Door bell is fitted to the door frame and fitted close to the stone work and ir reflection may be keep reflecting from the stone work. I wanted to put it there to avoid getting the ring soak wet in rainy days and keep it discreet from the public. Since the last issue with the video Doorbell going offline, i then rebooted by pressing the reset button and since the last issue I think since 3rd April I had issue and then reset it on 05th April it has worked fine and not gone offline since. It may be I think now it recognises the WiFi, like have a dog and try it to get use to new home lol. i have put my 4 Channel recorder for sale, as Alyeti said buy the 8 channel, so I can have the 7 camera and the video door bell connected. 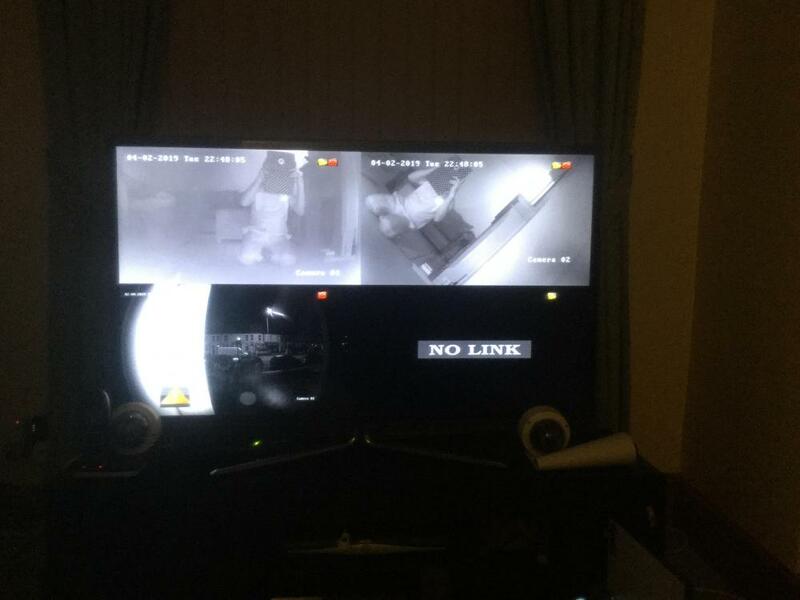 i am having 3 cameras at the front to monitor my house and my next door neighbour, which is my mum house. 2 camera one in my back yard and my mums back yard and 2 more camera outside in the alleyway. I have started to do the first fixing cable using the outdoor cat5e UTP cable given by the cctv guy and i purchased from online. Once I done all the cabling and fixing the camera, he will come and do the final fixing and test it for me, as he said it will not take more than hour, as long All the cable is pulled and fixed,as he only need to connect rj45 connectors to the cat5e cable. how do you do Alarm Input on the camera or is this motion detection again . What height camera do I need to have for the front door I can keep it about 2metres and the other camera I can keep it about 3 metres. i can send you pictures email if you can advice. thanks again for all your replies and feedback. Go To Topic Listing ! !..DIY Installers..! !